National Neighborhood Watch (formerly USAonWatch) does not advocate watch members taking any action when observing suspicious activity in their neighborhood. Community members only serve as the extra “eyes and ears” and should report their observations of suspicious activities to their local law enforcement. Trained law enforcement should be the only ones ever to take action; citizens should never try to take action on those observations. National Neighborhood Watch (formerly USAonWatch) encourages all watch groups to register with our national database where multiple resources are made available to assist in the training and maintaining of Neighborhood Watch groups and its members. NOTE: due to the large number of Neighborhood Watch groups across the country, “policing” and investigating them on the national level is not something we have the resources/capability to routinely do. In essence, Neighborhood Watch is a crime prevention program that stresses education and common sense (Stegenga 2000). It teaches citizens how to help themselves by identifying and reporting suspicious activity in their neighborhoods. In addition, it provides citizens with the opportunity to make their neighborhoods safer and improve the quality of life. Neighborhood Watch groups typically focus on observation and awareness as a means of preventing crime and employ strategies that range from simply promoting social interaction and "watching out for each other" to active patrols by groups of citizens (Yin, et al., 1976). Most neighborhood crime prevention groups are organized around a block or a neighborhood and are started with assistance from a law enforcement agency. Volunteers who donate their time and resources are typically at the center of such programs, since many do not have a formal budget or source of funding. One study (Garofalo and McLeod, 1988) found that most Neighborhood Watches were located in areas that contained high percentages of single-family homes, little or no commercial establishments, and residents who had lived at their current address for more than five years. This study also found that most of the programs used street signs to show the presence of the program to potentially deter any would-be criminals. All Neighborhood Watches share one foundational idea: that bringing community members together to reestablish control of their neighborhoods promotes an increased quality of life and reduces the crime rate in that area. As Rosenbaum (1988) put it ". . . if social disorganization is the problem and if traditional agents of social control no longer are performing adequately, we need to find alternative ways to strengthen informal social control and to restore a 'sense of neighborhood'". That's precisely what Neighborhood Watch strives to do. In fact, from the earliest attempts to deal with the neighborhood structure as it relates to crime (through the Chicago Area Project of the early 1900s), to modern attempts at neighborhood crime prevention, collective action by residents has proved one of the most effective strategies. The reason for this effectiveness is rather simple: Involving community members in watch programs decreases opportunities for criminals to commit crime rather than attempting to change their behavior or motivation. Today's Neighborhood Watch Program is an effective means of crime control and neighborhood cohesiveness. While not all of the programs in place today go by the same name, they all accomplish the same goal: to bring community members together to fight crime. As Minor aptly wrote, "Neighborhood is the key to maintaining successful relationships." In 1981, national data showed that 12 percent of the population was involved in some type of neighborhood watch group (O'Keefe and Mendelsohn, 1984). By 1988, it was estimated that between seven and 20 percent of residents of U.S. cities were involved in such activities (Rosenbaum, 1988). 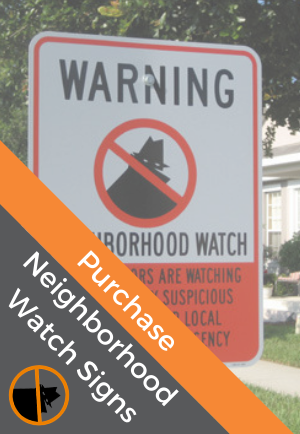 A national study (Whitaker, 1986) showed that 38 percent of households in neighborhoods that had a Neighborhood Watch program participated in the program. This study concluded that urban areas were more likely to have programs than suburban or rural areas, but that people living in the latter were likely to be involved in a program if one was organized. While consistencies in the presence of Neighborhood Watch programs based on location were identified, it was also determined that these programs varied in their organizational structure and agendas (DuBow, McCabe, and Kaplan, 1979). However, in spite of these differences, it was determined that the programs generally followed one or both of two approaches: "opportunity reduction" or "social problems." Neighborhoods are not the only places that need crime control. Organizations, and even entire industries, are also taking notice of the importance of programs like Neighborhood Watch. In fact, 1996, President Bill Clinton accepted a donation from the Cellular Telecommunications Industry of 50,000 phones equipped with free airtime to be used by Neighborhood Watches across the country. In addition to neighborhoods, where people work, shop, and play are the focus of much criminal activity. Oftentimes, however, there are not enough law enforcement officers to cover an area, so it is important that residents, workers, and others who are in the area work to support that area and reduce crime just as if it were a residential neighborhood. This section examines a few programs that have incorporated the Neighborhood Watch concept in unique ways. In the rural Shenandoah Valley of Virginia, news of crime reports often came too late. The area was so large and rural that the only contact between law enforcement officers was limited to radio communication. In light of an increasing theft rate, the area's sheriff decided that the most efficient way to communicate with the citizens of the county was through email. With the help of local news stations, the Sheriff's Office compiled a list of residents' email addresses and alerted them each time there was a criminal trend. They also asked each person to add a friend to the list. As the list grew, the crime rate decreased. The effectiveness of the system was demonstrated when there was a rash of mailbox robberies. The sheriff sent out an email alerting citizens to the situation and asking them to refrain from leaving mail in their mailboxes. After the email, the mailbox thefts ceased. The county has continued to use the email system to keep citizens informed about crimes and even post photographs of wanted criminals. When there was a problem with poachers and illegal fishers in the Gulf of Mexico, the Coast Guard and the National Marine Fisheries Service had to get creative, since they did not have a budget to draw upon to solve the problem. They enlisted the help of the civilians who worked on offshore drilling rigs, supply boats, and legal fishing vessels and asked them to report any suspicious activity. The civilians eagerly helped, and within weeks the Coast Guard received tips that lowered the incidences of poaching in that area. In California, when the manager of an aircraft company realized that the auto theft rate at the company had risen 300 percent, a Neighborhood Watch was developed. The company first designed a visible concept that would alert all of the workers at the plant about the problem. Posters and flyers were made that described the problem and asked for help. Procedures were then put into place for employees to report any suspicious activity to security. Regular meetings were held so that everyone was kept up to speed on the situation. Company officials were enthusiastic about the program and often held raffles and distributed prizes at the meetings. By the end of the year, the car theft rate had dropped by 35 percent. As these examples demonstrate, there are many ways in which the Neighborhood Watch concept can be put to use. One of the most important elements is ensuring that every person involved knows what to do when suspicious activity is noticed. Click here for a list of some other programs. The Neighborhood Watch concept is not only an American concept; other countries are employing it, as well. For instance, while President, Nelson Mandela demanded that the people of South Africa take responsibility for their neighborhoods by keeping an eye on the houses next to them. He made this request with the hope that this would deter criminal activity. In addition, the Alice Springs Hospital in Australia developed a Watch program within and around its facility. The concept behind the Watch was essentially the same as the traditional Neighborhood Watch in that it was implemented to "empower individuals to take some ownership of the security needs of their environment." The hospital noticed an increase in theft and other illicit activity, but there was not enough security to cover the entire hospital all of the time. In response, they divided the hospital into zones and established a coordinator for each zone. The coordinators communicated with one another so they were aware of particular problems when they arose. If someone noticed something suspicious, for instance, he or she alerted a representative in the other areas so that they could be on the look out. Knowing there was always someone watching out for them gave the employees a sense of security. That sentiment epitomizes the meaning of the Neighborhood Watch Program.